Buy the audiobook of the highly popular kettlebell training book for beginners. Available in male and female version. Internet connection required to play the audiobook. The audiobook is 2 hours and 47 minutes, packed with information that every kettlebell beginner, enthusiast, or trainer should know. The audio comes in male and female voice. This book is packed full of excellent information. A great tool for the new kettlebell user all the way to the seasoned veteran! Taco has a way of breaking down the basics of the kettlebell workout that anyone can understand and leaves nothing up to questions. The passion he has for making sure that the kettlebell is understood and used appropriately is apparent in ever chapter of this book. I highly recommend this for anyone who is looking to further their understanding of the kettlebell! This information starts out very basic with, what and how kettlebells work with your body. Breaking it down to the foundation of the science behind the techniques. For anyone looking to taking their training to the next level, this paired with Taco’s website cavemantraining.com are invaluable tools. I was expected a narrow view of training with kettlebells from a strict one way or the highway mindset but, this book delivers an open minded, comprehensive and well thought out approach to training and exercise with a kettlebell. The general emphasis is perfect for a beginner to intermediate user and what is particularly great are the detailed explanations of the whys and hows of using kettlebells to develop a well balanced, strong, mobile and lean body. The author explains in the simplest to understand terms (no techno jargon here) how the reader can execute a wide variety of movements suitable for everyday people looking for a durable physique. In addition, safety tips, progressions and regressions are offered too. 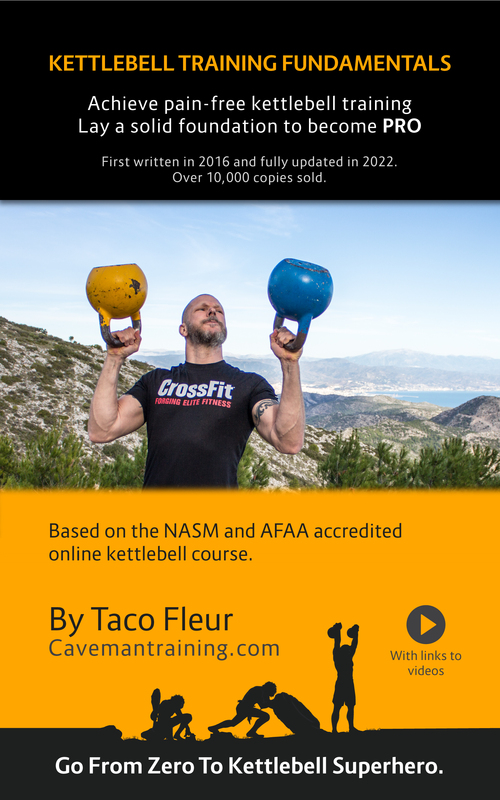 Very clearly, Taco is a vey experienced and passionate kettlebell trainer and many kettlebell enthusiasts will enjoy this book. Thanks for the great review Jamie. I see you live in Albany Creek, I used to live in Eatons Hill, right next to it. Awesome area.